U.S. Sen. Ted Cruz has opened a new front in his crusade to paint his Democratic challenger, Beto O'Rourke, as out of step with solidly red Texas. The U.S. Senate race between Ted Cruz and Beto O'Rourke is trending into new territory: the war on drugs. It is a familiar topic for O'Rourke, a Democratic congressman who has earned a national reputation as an advocate for marijuana legalization since his days on the El Paso City Council. Yet it hadn't become an issue in the Senate contest until now, as Cruz, the Republican incumbent, ramps up his general election crusade to paint O'Rourke as too liberal for Texas. Cruz opened the new front Tuesday as he seized on a story published by the Daily Caller, a conservative news site, that claimed O'Rourke "once advocated for the legalization of all narcotics." The story cited an episode on the El Paso City Council in 2009 where O’Rourke successfully — and controversially — amended a resolution about the war on drugs to urge for an "honest, open national debate on ending the prohibition on narcotics." "Reasonable minds, perhaps, can differ on whether marijuana should be illegal, but what Congressman O’Rourke introduced was a resolution for the City Council to take up legalizing all narcotics, legalizing everything, legalizing heroin, legalizing deadly opioids," Cruz told reporters after a campaign event in San Antonio as his Twitter account sent out a similar line of attack. "As this country is facing a crisis — an opioid crisis ... and in light of that growing tragedy, Congressman O’Rourke’s radical proposal to legalize all narcotics is a suggestion that might be very popular up at Berkeley. It might be popular in far-left circles, but it doesn’t reflect the values of Texans. Texans don’t want to see heroin and deadly opioids legalized and our kids able to just walk in to the corner store and buy them." Despite Cruz's telling, the resolution did not explicitly call for legalizing all drugs but rather for a conversation about it. O’Rourke said as much at a Jan. 6, 2009, council meeting, video of which accompanied the Daily Caller story. The resolution was ultimately vetoed by the mayor, John Cook, after he received pressure from elected officials worried that it could cause El Paso to lose out on federal resources. Among them was U.S. Rep. Silvestre Reyes, D-El Paso, who lobbied the council to vote against a subsequent effort to override Cook’s veto. Reyes, whom O’Rourke would unseat a few years later, got his way: The veto override effort was unsuccessful, though O’Rourke still voted for it. O'Rourke would later concede that the language in the controversial amendment could have been handled better. "It was an artless and even inaccurate amendment to the larger resolution (I only learned later that marijuana is not a narcotic, even though it was precisely that drug that I felt people would be most open to debating), but it got the point across," O'Rourke wrote in his 2011 book, "Dealing Death and Drugs: The Big Business of Dope in the U.S. and Mexico," which made the case for ending the federal prohibition on marijuana. The attack is not new to O'Rourke, who faced it as he battled Reyes in 2012, ultimately dislodging the eight-term incumbent in a bitter primary. Reyes ran an ad that showed a group of young children shouting "no" and expressing disbelief as text on the screen claimed O'Rourke "wants to legalize drugs." The fact-checking site PolitiFact rated that claim "Half True" at the time. O'Rourke has not made marijuana legalization a major part of his U.S. Senate campaign. But at town halls and other campaign events, he does not shy away from the topic when the discussion turns toward it or when he is directly asked about it. Such was the case Saturday morning as O'Rourke made a campaign stop in Sonora, a small city on the western edge of the Hill Country. Soon after he slid into a booth with patrons at a donut shop, he was fielding questions for several minutes about marijuana legalization. Cruz, for his part, has long maintained marijuana legalization should be left up to the states, though he personally opposes it. He reiterated that position while speaking with reporters Tuesday in San Antonio. "I don’t support drug legalization," Cruz said. "I think drug legalization ends up harming people. I think it particularly hurts young people. It traps them in addiction." On marijuana, Cruz added: "I’ve always said that should be a question for the states. I think different states can resolve it differently. So in Texas — if we were voting on it in Texas — I would vote against legalizing it. But I think it’s the prerogative of Texans to make that decision, and I think another state like Colorado can make a very different decision." 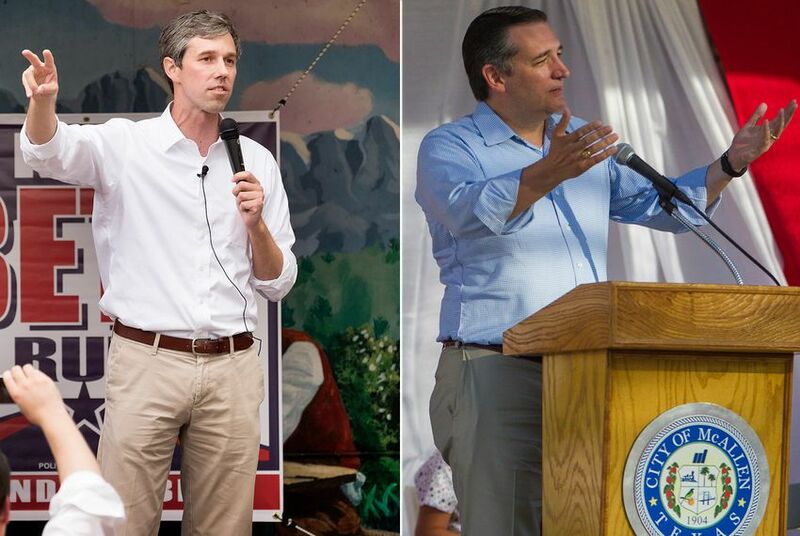 While O’Rourke did not directly respond Tuesday to Cruz’s criticism over the council resolution, the El Paso congressman — coincidentally, apparently — got the endorsement on the same day of the National Organization for the Reform of Marijuana Laws. The group, which supported O'Rourke when he first ran for Congress, hailed him as a “true champion for abolishing our disastrous prohibition on marijuana since the very beginning of his political career as a city council member in El Paso."